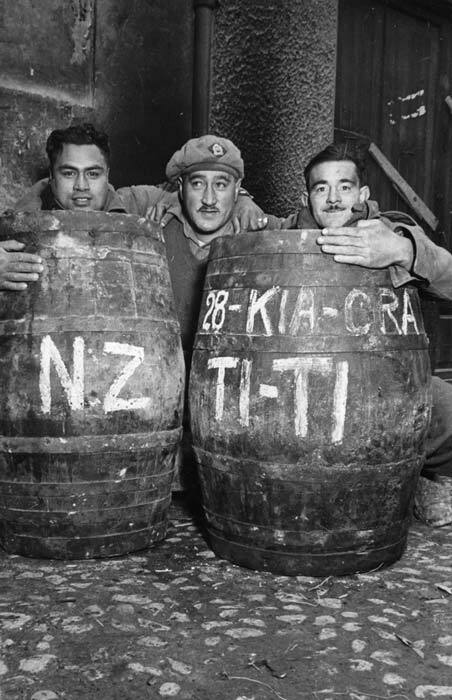 28th (Māori) Battalion soldiers look happy to receive barrels of tītī (muttonbirds) during the Italian campaign in 1944. The soldier on the left is Tom Poki of Whāngārā on the East Coast, while the man on the right is Rodney Pitt of Gisborne. Māori at home helped boost the morale of their men overseas by sending them containers of preserved traditional foods such as tītī, pipi and pūpū (types of shellfish), tuna (eel), mangō (shark), kōura (crayfish), kūmara (sweet potato) and karaka berries.